The American Academy of Pediatrics recently endorsed two controversial childrearing practices: sleep training and circumcision for infants. Both practices violate ancestral caregiving practices which we know are linked to positive child outcomes. Over 30 million years ago the social mammals emerged, characterized by extensive on-demand breastfeeding, constant touch, responsiveness to the needs of the offspring, and lots of free play. Humans are one branch of social mammals. Over the course of evolution, humans became the neediest newborns at full term birth, with 75% of the brain yet to grow and over 20 years of growth before adulthood. Why such a long period of growth? When humans became upright and bipedal, women’s pelvises shrank in size to make walking possible. To accommodate the shift, babies had to be born at an early stage of growth (Trevathan, 2011). In fact, according to comparisons with other animals, humans are born 9-18 months early! That means an “external womb” is needed for the rapid brain growth that occurs in the first years of life. Hence, the need for the intensive parenting that co-evolved with the neediness of infants. These practices are universal among hunter-gatherer societies who sustain good health and, after age 15, live as long as we do (Fry, 2006; Hewlett & Lamb, 2005; Lee & Daly, 1999). All these caregiving practices are known to influence development and health over the long term. The influence of caregiving occurs through the processes of epigenetics and developmental plasticity. Caregiving turns genes on and off, shapes stress response, establishing thresholds and ratios of cells in every system in the body and affecting the trajectory of growth (Lupien, McEwen, Gunnar, & Heim, 2009; Meaney, 2010). When these caregiving practices are missing or of poor quality, it impairs outcomes for the child, influencing the development of body/brain over the long term. The infant’s experience is a historical record written in his or her body/brain, which sometimes becomes apparent only later in mental and physical health outcomes (Schore, 2003a, 2003b). For example, stress reactivity eats away at mental and physical systems and makes social relations difficult. All animals have a developmental niche for offspring. The niche for human infants is the aforementioned caregiving practices. In effect, human caregiving practices and baby needs represent an evolved developmental system (Oyama, Griffiths, & Gray, 2001). The evolved system leads to species-typical outcomes (Lickliter & Harshaw, 2010). Species-typical outcomes are seen in hunter-gatherer communities that still follow these practices where individuals have pleasant personalities, and social and intellectual acumen (Lee & Daly, 1999). However, when these practices are violated, the evolved developmental system breaks down and leads to species-atypical outcomes. In light of evolved systems, we should not be surprised when violations of intensive parenting practices lead to poor outcomes for children on all fronts — mental, physical, social, and intellectual. Indeed, that seems to be the case as child wellbeing has been deteriorating for some decades in the USA (e.g., Heckman, 2008; UNICEF, 2007). Our aims for childbirth, childrearing and child wellbeing are too low. From Research to Practice and Policy with Jaak Panksepp, Allan N. Schore and Tracy R. Gleason. She is an Associate Professor of Psychology at the University of Notre Dame. Her research focuses on moral development through the lifespan with a particular emphasis on early life effects on the neurobiology underpinning moral functioning (triune ethics theory). Dr. Narvaez has co-authored or co-edited seven books and is editor of the Journal of Moral Education. 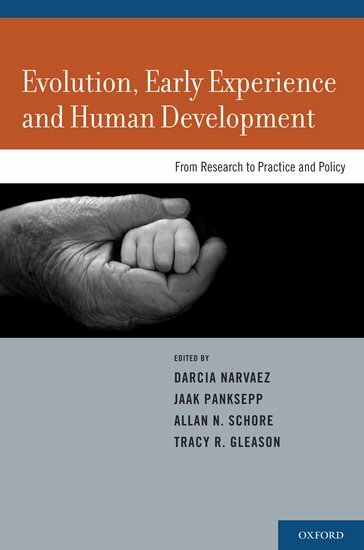 Evolution, Early Experience and Human Development: From Research to Practice and Policy discusses the caregiving practices mentioned above in light of their effects on child outcomes. It has chapters by the experts in each area and each scholar provides detail on how a caregiving practice influences child outcomes. The book contains a variety of perspectives beyond the one here, including some that emphasize the adaptiveness of stress reactivity. Image credit: Young mother and her baby, sleeping in bed. Photo by SvetlanaFedoseeva, iStockphoto.